I chose LittleBigPlanet for a specific reason. Sure, it has an extensive level editing suite and the ability to import custom images and text, but that's not particularly unique - I could have toiled away at a custom Counter-Strike map based on the Nativity scene or spelled out the words "Merry Christmas" with Far Cry 2's mountain paint brush. More importantly, my mother adores Sackboy. Whenever she watches me play LittleBigPlanet, she'll make me change his clothes and accessories, assembling suitable outfits from his array of quirky hats and meaningless props. She's quite literally pained whenever he's squished, burnt, electrocuted or pricked by spikes. And she loves the world that Media Molecule designed, with its upholstered mountains, lollypop-stick flagpoles, cardboard architecture and sticker decorations. Up to that point, watching me play was as far as she'd go. LittleBigPlanet is the latest evolution in a long line of 2-D platformers, so having absolutely zero prior knowledge of Super Mario Bros. or Sonic the Hedgehog outside of faint name recognition was quite an impairment for her. And then there's LBP's baffling three-lane depth system, its not-quite-perfect jumping physics, the overwhelming number of inputs on the PS3's controller and the sheer difficulty of many of its levels. My present wouldn't be a passive experience, though - if I wanted to sit my mother down and demo a LittleBigPlanet level for her, I might as well have written a poem or made a video. No, I wanted her to play, and I wanted to be in the backseat for once, the one saying "Aren't the graphics getting good?" "Wow, you're good at this!" and "I think you should put him in the Santa hat and sunglasses." The first step was taking out the extraneous Z-axis by creating icy mountains out of snowflake-print cushion covers in the two background layers. This left only one level of depth for traversal - a way to avoid unnecessary complication, I hoped. Then I added information on how to navigate the level in the form of in-game buttons that triggered instructional tooltips when stood upon, which precluded the need for tutorials or invasive "let me show you" moments. I tinkered away in my digital workshop for weeks, tweaking corners and adorning every wall with Christmassy stickers and decorations. Finally, after hundreds of play-throughs and iterations, I was happy with the design. I dragged my PS3 into the downstairs living room to hook it up. On Christmas morning, the slick black console was almost hidden under a sea of shiny boxes and reflective paper. 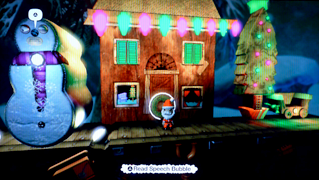 When it came time to open presents, I dug it out, loaded up LittleBigPlanet and searched the game's knitted globe for my level. The family, limited to just my mother and father at that early hour, gathered around the screen to see Sackboy pop into a winter wonderland. I passed the controller to my mother, who tentatively wiggled the sticks and fumbled her thumbs across the face buttons. After shuffling about aimlessly for a few seconds, she ran into a giant, smiling snowman looming outside an ornately designed house, who told her that she must save Christmas by helping him make the final preparations. My mother wrangled with the gamepad a little while longer, but quickly gained control of the squat burlap creature, sending him careening down a hill on a tiny sledge.